The What: Extron Electronics has begun shipping its DSC DP-HD A, a high performance, HDCP-compliant scaler that converts DisplayPort signals to HDMI. The What Else: It accepts DisplayPort video at resolutions up to 3840x2160 @ 30 Hz with reduced blanking, and offers high performance scaling with multiple output rates up to 1920x1200, including HDTV 1080p/60 and 2K. 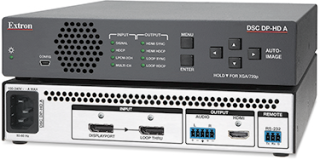 The DSC DP-HD A features advanced Extron video signal processing with 1080i deinterlacing and Deep Color processing for optimal image quality. It includes many integrator-friendly features such as auto-memory presets, on-screen display, test patterns, EDID Minder, stereo audio de-embedding, and a DisplayPort input loop-through, while the compact enclosure simplifies installation. The DSC DP-HD A is ideal for interfacing high resolution DisplayPort signals into AV systems with an HDMI switching and distribution infrastructure. "The DSC DP-HD A delivers an essential feature set for interfacing high resolution DisplayPort signals with HDMI-based AV systems," says Casey Hall, VP of sales and marketing for Extron. "The input loop-through connection preserves the DisplayPort signal at its original resolution for local monitoring, while the powerful scaling engine and video processing capabilities ensure consistent, reliable signal conversion with high image quality." The DSC DP-HD A offers several features that enhance and simplify AV system integration. EDID Minder automatically manages EDID communication between the source and display to ensure reliable operation. The DSC DP-HD A includes a buffered DisplayPort input loop-through that provides an output signal for a local monitor. Additional audio capabilities include selectable audio muting and output volume control. The DSC DP-HD A includes a convenient analog two channel audio output for sending de-embedded audio to a sound system or other audio destination. This output can be set for stereo or dual mono.